Similar concept to Van de Graaff generator. A transformer collects (negative) charges on the small center sphere. The charges in the center want to get away from each other. They jump off the sphere to get farther away from the other charges. 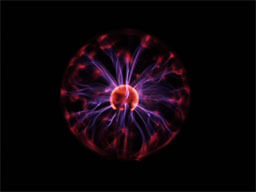 The gas inside the Plasma Ball glows where the electricity passes through the air. The charges are trying to go where there is no built up charge. The sphere builds up charge really fast because it's small. The earth is REALLY big so you can pour charges into it forever and they'll never build up. Charges always take the shortest, easiest path. If your friend lives next door, you wouldn't walk around the block just to go to their house. It would be easier to just walk straight there. Now if someone puts up a really tall fence between your two houses, then climbing over it might be a SHORTER path, but it's probably EASIER to just walk around it. This is important: "shortest path" doesn't always mean distance. "Easier path" is more accurate. If the charges are given an easy enough path to the earth, they will ALL go that way (instead of spreading out all over the Plasma Ball and traveling through the air). When you touch your hand to the surface, the electricity flows from the Plasma Ball through your body, down to the ground (earth). Keep anyone with a heart condition or pacemaker away from all our electricity demos. Touching something metal (like the edge of the table) while touching the plasma ball can shock you. It's not dangerous, but it can be startling. Leaving your hand on the sphere in one place for a long time generates heat. When chaining people together, it can get hot pretty fast for the person holding the Plasma Ball. Like charges repel. Opposite charges attract. This is at the heart of all our electricity demos. Explain that the colored arcs are caused by the charges moving through the gas (this works the same way as lightning in the air). Tell them that charges want to get to ground (the earth). See above for a good explanation. Talk about "easiest path" by choosing a good example (or use the one we included). Try not to get bogged down with a story that doesn't illustrate your point simply. After talking about these things, put your hand on the Plasma Ball as an example. This and the next several points are just illustrating these same concepts in different ways. Explain that electricity flows through people pretty easily (compared to air, plastic, wood, etc). The amount of power from the Plasma Ball is very small so it's safe. But electric outlets are much more powerful, so that's why they're dangerous. To show just how good conductors people are, try "daisy chaining" several van members together: Have the first person touch the Plasma Ball and hold hands with the rest of the chain. The last two people should hold the light bulb between them to show that the electricity is still flowing. 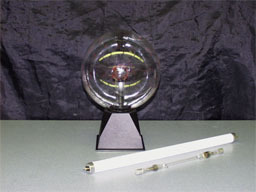 When the first person is touching the sphere, the bulb will light up at the other end of the chain! Make a big deal about how the electricity is flowing from the Plasma Ball, all the way through the chain, through the light bulb, and down the last person to the floor. It's important to insulate the whole chain from the ground except for the last person, or else the charge will flow out before it gets to the light. The light will be pretty dim after all that resistance, so the room needs to be pretty dark.